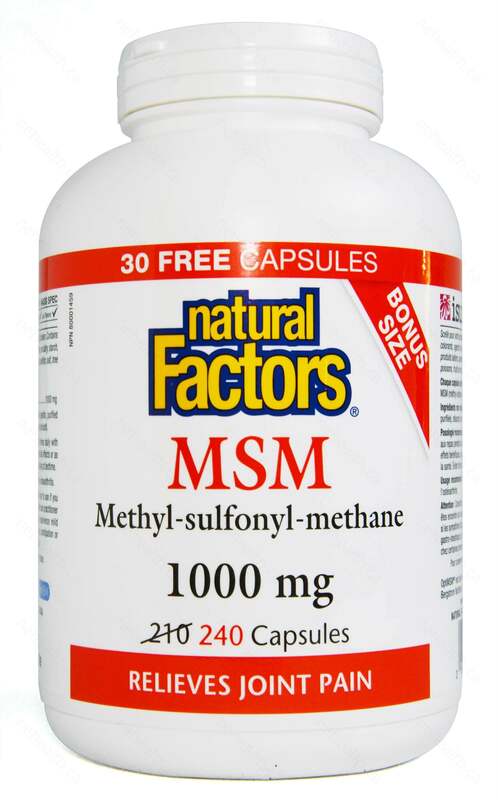 MSM (Methyl-sulfonyl-methane) is a naturally-occurring sulphur compound found in our body. It helps to build proteins, enzymes and hormones. Besides, it is also an essential component for the formation of our connective tissues. As a supplement, it is safe, potent, non-toxic, and bioavailable. It has promising results in alleviating joint pain and inflammatory conditions including rheumatoid arthritis, osteoarthritis, connective tissue conditions, chronic muscle pain, fibromyalgia, tendonitis, carpal tunnel syndrome etc. 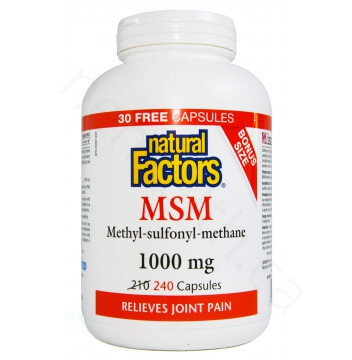 Natural Factors uses a premium organic sulphur source for MSM and can be taken alone or in combination with glucosamine sulfate and chondroitin sulfate to provide maximum joint pain relief. What Are the Key Health Benefits Associated with Natural Factors MSM? Non-medicinal ingredients: Gelatin capsule (gelatin, purified water) , vegetable grade magnesium stearate (lubricant). 1 capsule, 2-3 times daily or as directed by a health practitioner. Kim, L. S., et al. "Efficacy of methylsulfonylmethane (MSM) in osteoarthritis pain of the knee: a pilot clinical trial." Osteoarthritis and Cartilage 14.3 (2006): 286-294. Usha, P. R., and M. U. R. Naidu. "Randomised, double-blind, parallel, placebo-controlled study of oral glucosamine, methylsulfonylmethane and their combination in osteoarthritis." Clinical Drug Investigation 24.6 (2004): 353-363.